I've been GONE SO LONG! Now I am back, and I have goodies to share! Attention! I have changed the method of my giveaway to a Rafflecopter. There were no notes left on my Giveaway post as of yet, so I hope that this won't cause confusion, but rather enable a wider variety of participants. Good luck to everyone. Frippery Digits Gone So Long Giveaway!! 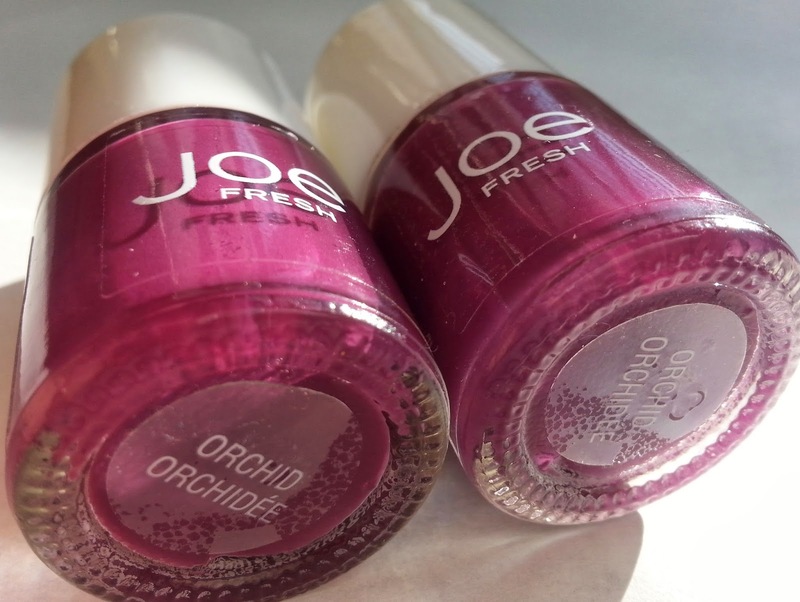 One bottle of Joe Fresh Orchid will be stashed in with each prize! 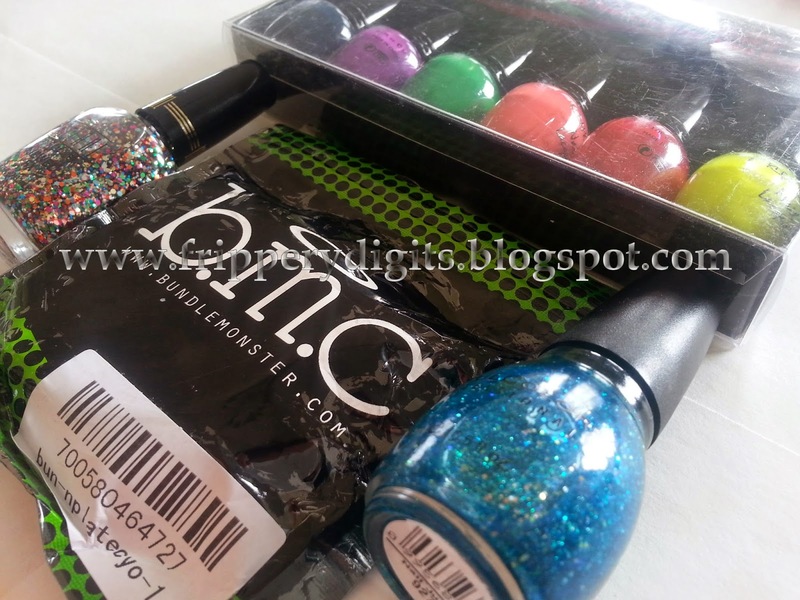 All of the nail polish was purchased by me for this giveaway and has not been used, though it may have been opened. I won the Bundle Monster plate sets when 5 of my designs (yay!) were selected for the 2013 CYO Contest, so I am spreading the love! Did you know that Bundle Monster is holding a second CYO contest? The deadline is March 31st! Check it out! I do everything in my power to prevent spills and damage during shipping, but I can't guarantee they will arrive in tact. I don't receive any compensation for any products available in this giveaway. Please see my disclosure for any further info. I would greatly appreciate any buzz you are willing to generate about my blog and my giveaway of your own volition. I am also interested in beefing up my blogroll, so if you have a nail art blog and you want me to check out leave a link in the notes! :) No extra entries though. Just community building! Hi! My favorite many was the Cheeky Rainbow Digits! Love the Prizes!!! Good Luck EVERYONE. 6/27/13...I am in love with the teal-on-teal stamping with the square stud. Its just awesome the way they all nest together and the colors! Also, welcome back :-). I'm pretty sure I am in the system as "EVA"
I love your mani called I RAINBOW SPARKLY HEART BUNDLE MONSTER. It is sparkly and colorful and girly. What's not to love?? My name is Kellie Murray but it could be kelliemurray on rafflecopter. Best of luck everyone. Thanks for the opportunity. What a sweet thing for you to do! Good luck to all! I love the Black and White Blended Stamp on China Glaze Concrete Catwalk that you did last year. Love how beautifully it turned out, and I am going to try out something similar. Hi, I'm Patrycja / Amethyst from Poland. 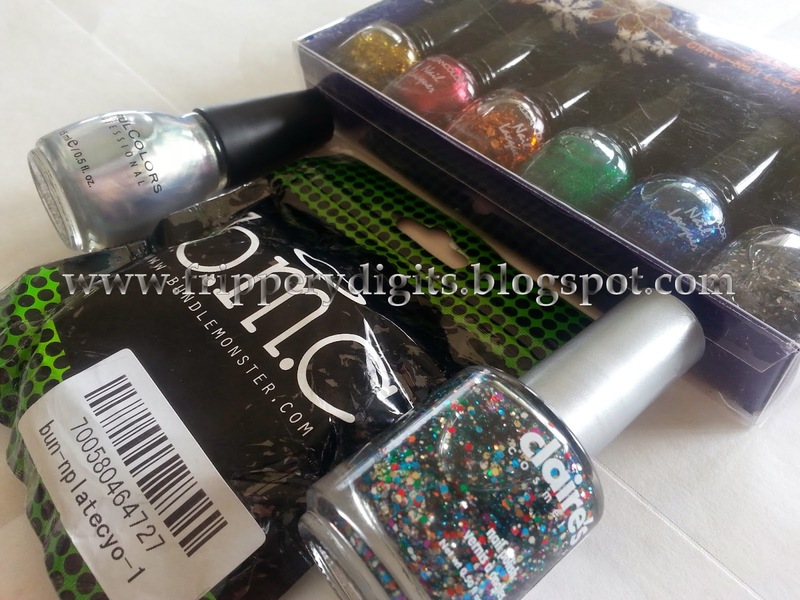 I like your mani with Rainbow Sparkle Heart - Bundle Monser Plate. Wauw whata great five away! I think my name is Anitra Hermes on it. I'm just in love worn this give away ant I'm so happy for the ones that win and hope they enjoy everything in the set, cause it's really beautiful! What a great giveaway! I am one of you new followers, so I had to browse a little bit your blog to see your nail art and I found a lot of neat looking designs! It is hard to tell you which one is my favorite because they are all having something special, but one draw my attention very quickly and that is the first mani from this post (http://fripperydigits.blogspot.ca/2013/06/born-pretty-review-nail-art-studs.html) made with the Cheeky plate! Love everything about it! My favorite mani is the one with the hexes and nail art tape. I know how much time it can take and getting the placement so neat. very generous of you :)) love ya blog and Cheeky Rainbow Skittles!! Thanks for the giveaway. I would gladly have won, because I did not have plates from Bundle Monster. Love the pink with grey stamping! Hi!! I'm new in this kind of blogs, I was reading your posts ans I really love the Tgif Rainbow stamp, I didnt't that you can create all this kind of manis whith the stamper. Great giveaway! I'm new to your blog and I really enjoyed the layered stamps post. Very creative. I would love to try it out for myself. P.S. should read all the way, But I am Becca M. on Rafflecopter. My favorite mani has got to be that ridiculous basket weave tape mani you did. Love! That's so cool that you won the cyo contest! Hi my favorite is I RAINBOW SPARKLY HEART BUNDLE MONSTER. Omg i won the competition. first time ever winning something!!! Super Bright St.Patty's Day Mani!